Pedigree Dog Treat's are on a temporary price cut for a $1, and we have this $3/3 ANY Pedigree Treats! coupon making them FREE! There is also a 10% Cartwheel offer, which could turn into a moneymaker if you have other items in your cart! 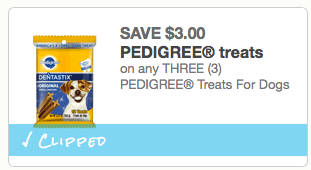 Use (1) $3/3 ANY Pedigree Treats!